Milly stretch silk top with cascading ruffle at sleeves. High, round neckline; keyhole behind neck. For in-store inquiries, use sku #2370154. 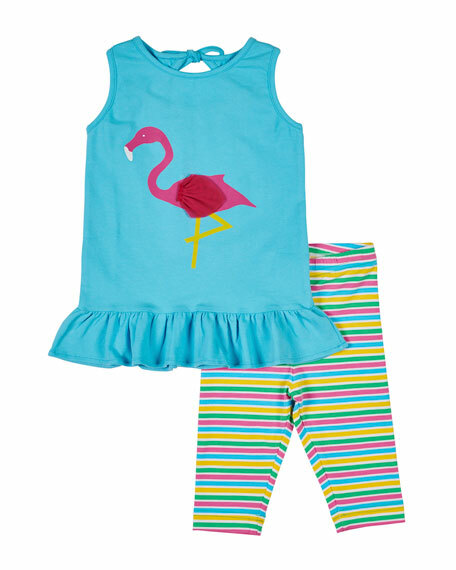 Florence Eiseman solid tank with flamingo graphic. Round neckline with self-tie keyhole back. Moderate shoulder coverage. Ruffle hem. Includes multi-stripe leggings. Elasticized waistband. Cotton/spandex. Made in Peru.